Slender semi-aquatic Sweet-flag (Acorus calamus) is neither a sedge, rush or grass but belongs to the Acoraceae, an obscure family with only one genus and two to four species worldwide (Heywood et al, 2007). Acorus was previously part of the Araceae (Arum family) because of its similar flower spike (spadix), tiny flowers, and leaf-like bract (spathe). Thought to be native to India, A. calamus arrived in Europe by trade and botanical exchanges. It has been naturalized in the UK since 1668 (Roy & Walker, 2012) and now occurs scattered throughout Britain. On campus, a healthy population grows at the northern end of Whiteknights lake. 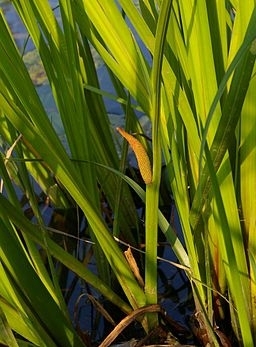 All British plants are believed to be sterile but despite its infertility A. calamus reproduces happily where it grows. The secret to its success is its rhizome, an underground network of stems which expands through shoots and roots from its nodes. Rhizome pieces are also buoyant in water and easily float to new locations, where they grow into separate, genetically identical plants. A. calamus flowers (left) are infertile. The reproductive rhizome (right). Sweet-flag can be identified by its wavy leaf margins and distinct citrus scent that is released when leaves are crushed. The aromatic oil contains numerous active compounds and has long been valued for its medicinal properties and as an insecticide. More Sweet-flag secrets are revealed in ‘The Ethnobotany of Sweet-flag’ by Timothy Motley. Heywood, V. H., Brummit, R. K. and Culham, A. (2007) Flowering Plant Families of the World, Revised. Firefly Books, Ontario. Roy, D. and Walker, K. (2012) ‘Online Atlas of the British & Irish Flora’, [online] Available from: www.brc.ac.uk/plantatlas/. All text copyright of author. This entry was posted in Acoraceae, Flowering Plants, Plants and tagged Acoraceae, Acorus calamus, rhizome, Sweet-flag. Bookmark the permalink.